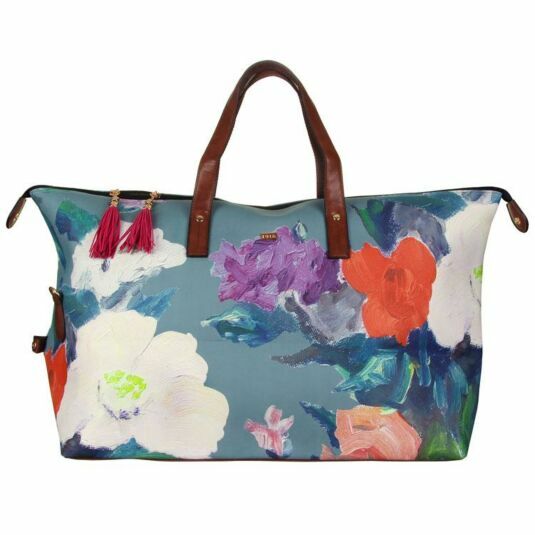 Whether it’s a business trip or a city break holiday, travel in style with this elegantly chic vintage style weekend bag, part of the 1916 range from Disaster Designs. 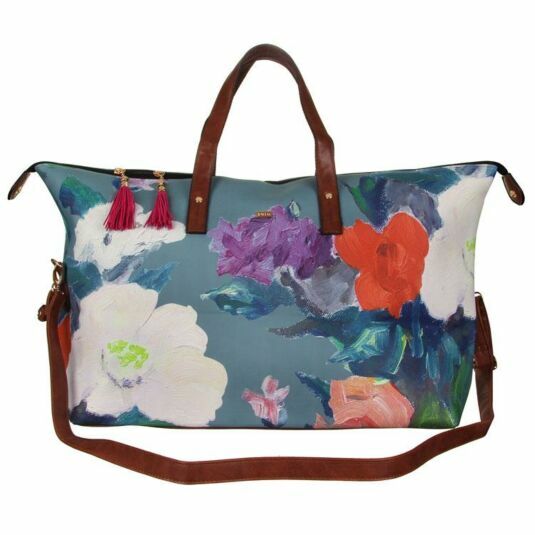 Featuring a painterly floral design in soft pastel colours with a canvas effect textured finish, on a tan brown leatherette base and handles, this spacious weekend bag can hold all of your essential items for a weekend away. 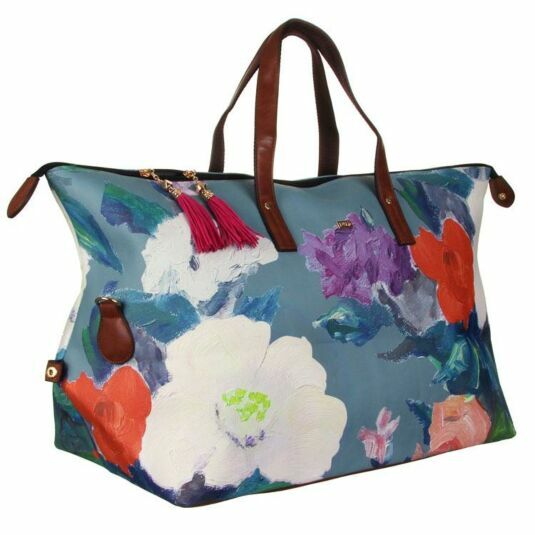 With dual zip-fastening, the bag will keep your precious items safe and secure. The large main compartment contains a contemporary lining with a hot pink hand drawn grid pattern on a mid-grey background, and is able to hold items such as your clothes, towels, shoes, purse and books. Inside there is an additional zipped pocket with enough space for your lighter essentials such as your mobile phone, tickets, phone or makeup. The base panel of the bag has 5 gold studs to keep the bag elevated for extra protection, and there is a shoulder strap that can be adjusted to your comfort. Finishing touches such as a hot pink suede effect tassel with gold metal bead charm, and a 1916 debossed gold metal badge add to the sophistication of the design. This item would make a great gift for fashion conscious women of all ages, including teenagers, mothers and grandmothers. 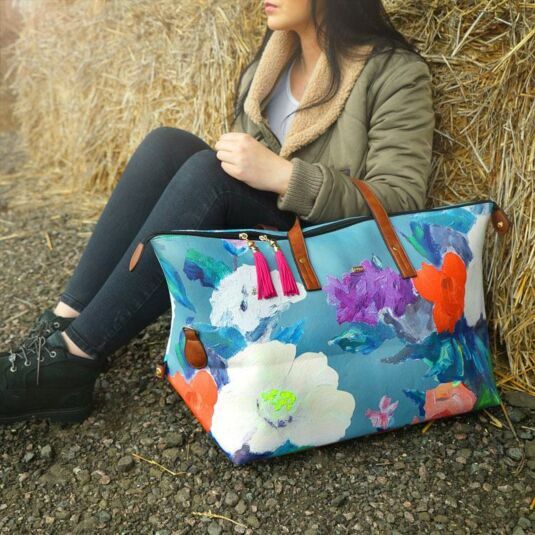 Evoking memories of an idyllic British summer scene, with rolling green hills, pastel blue skies, flowers that dance in a gentle breeze, and birds in full song, the 1916 range from Disaster Designs features a variety of stunning oil painted floral designs.